Fruit; large, oval, angular and ribbed. Skin; dull green on the shaded side, brownish-red streaked brighter red next the sun, with some thin russet markings. Flesh; yellowish, firm, rich, aromatic. [HP pl.XLI ]. Found about 1800 at Truro in Cornwall. The word Gilliflower is derived from the French word girofle, meaning clove. It produces a hardy, free growing tree but is a shy bearer. ‘The best apple that is known if high flavour combined with rich, subacid, saccharine juice, be the quality we most desire in fruit.’ Ripe from December to May. [HP pl.XLI ]. Described and figured in the Pomological Magazine. ‘This is the best Apple that is known, if high flavour, combined with a very rich subacid saccharine juice, be the qualities we most desire in fruit; but it is a bad bearer. Its merit is, however, of so decided a character, that no one who is aware of its excellence would wish to be without a tree or two, for the sake of the chance of adding so valuable a variety to his winter dessert. It ripens in November, and will keep till April. The fruit is apt to grow from the extremities of the shoots, which should be remembered in pruning the trees. 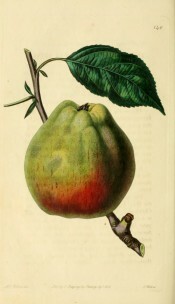 The first account of this sort is to be found in the Hort. Trans, vol. ii. p. 74, in a letter from Sir Christopher Hawkins, in 1813. It was discovered in a cottage garden near Truro, about ten or fifteen years before that date; and was considered by the Society of so much importance, that the silver medal was awarded to Sir Christopher Hawkins for his exertions in bringing it into notice. It has already found its way abroad; for the Horticultural Society received it in 1826 from Messrs. Baumanns, of Bollwiller, under the name of Calville d’Angleterre.’ [PM t.140/1830]. PB pl.LXXXVIII/1812. Listed in the 1845, 1850 and 1857 catalogues [Apple no.29/1845]. There are two references to this apple in William Macarthur’s records. February-June. Middling. An excellent dessert fruit equal to the Ribstone Pippin. Tree [two words indistinct] blight. [Notebook no.9, MP A2948]. MP, Vol. 55, A 2951, diary B, 1862. February-March. an excellent dessert fruit like Ribstone Pippin, large misshapen fruit liable to crack in wet weather. [Diary B, 1862, MP A2951].